Plenty of teams and individual athletes have contributed pages over the years to the Artesia High School golf program’s history book. They’ll need to add an entire chapter for the Bulldogs and Lady Bulldogs of 2017. After finishing Day One of the Class 5A State Tournament Monday at The Canyon Club in Albuquerque in second place, the AHS golfers took the turf by storm Tuesday – somewhat literally. But not even a two-hour lightning interruption could throw the ‘Dogs and Lady ‘Dogs off course, as the boys in orange lopped an impressive 11 shots off their first-round total and the girls shaved away a crucial three to sweep the event and bring some precious hardware home to a display case filled to bursting this season: a pair of shiny, new, blue trophies. “I’m so proud of these kids,” head coach Dusty Bean said Tuesday from the road. “They’re awesome. They’re like brothers and sisters. They play golf together, they hang out together… they are teammates. A state tourney sweep is rare enough. But that wasn’t the only staggering accomplishment Artesia left on the links Tuesday. 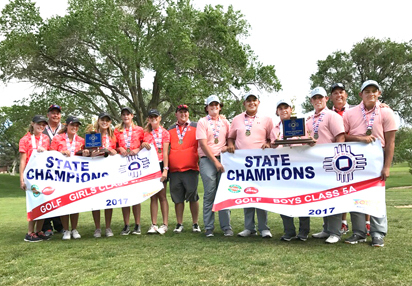 The companion wins were a first in school history, as well, as the Lady Bulldogs took just their first state title in 2016, successfully defending it to join the Back-to-Back Club. The Bulldogs last lifted the blue in 2007 and have three total championship notches on their belts. The Artesia girls also capped off an undefeated season. The Lady ‘Dogs took top honors at all 11 events in which they competed this year, nine of those coming against a mix of squads from all classifications. The ‘Dogs never finished lower than fourth, winning five outings over the course of the year, and were undefeated against 5A competition. The squads in orange had to count themselves fortunate Tuesday that weather didn’t play as large a role as it did in the Class A-4A tournament in Farmington. There, conditions were deemed too dangerous to continue, and the champions were decided based on their Day One results. “All the courses we’ve played at state are championship courses, and this one was just as hard, but with the weather we had added in, these were the toughest conditions I’ve ever seen at a state tournament in 13 years of coaching,” said Bean. The Lady Bulldogs had found themselves one shot back of a familiar foe after Monday’s opening round: the Lady Sartans of St. Pius. Artesia and Pius were deadlocked at the end of last year’s two-day event, with the Lady ‘Dogs taking the title in a one-hole playoff, and it looked as though a similar showdown might be in the cards this season. But Artesia’s entire lineup rose to the challenge Tuesday. Standing at 366 as a team, Josey Jackson managed to stay in the 80s on the difficult course, following her Day-One 81 with an 85 for a 166 total and a second-place individual medal. Taysea Powell maintained in the low 90s (90-92=182, 7th), and the rest of the squad did the gardening, trimming 14 total strokes off their first-round scores. Brehnan Davis finished with a composite 183 (93-90, 8th), Bri’Le Ybarra a 198 (102-96, 22nd), and Teagan Archer a 215 (110-105, 33rd) to help Artesia outshoot the Sartans 363-365 and produce the one-shot win, 729-730. “It was a battle all day,” Bean said. “We had rain, a lot of wind, and a very tough golf course on hard, fast greens, a course that you had to hit it at spots and had to hit it good every time – you couldn’t miss a shot. Our kids responded well to all the adversity and came back. The Bulldogs found themselves sizing up Los Lunas from the rough after the opening day of competition. Seven shots behind the Tigers (346-339), the ‘Dogs knew they had ground to cover Tuesday but they also knew they’d played well below their abilities Monday. “We knew the first day that we’d played a bad round – knew that we’d played probably one of the worst rounds we’ve played all year,” Bean said. “We knew we could make up that deficit. Bean said by the time the ‘Dogs – who started on No. 10 – were making the trek from No. 18 to No. 1, he had a sense the tide was turning. The ‘Dogs had only teed off a few athletes when the lightning delay was called, and Bean says he feels like it might have been more gift than hindrance. Jake Craft led the charge for the Artesia boys, cutting six shots off his first-round tally of 83 to finish with a 77 Tuesday and an overall 160. That earned him the fifth-place medal individually. Parker Sanders came in 10th overall with a 166 (82-84), Wesley Davis tied for 14th with a 177 (90-87), Tanner Parker tied for 16th (91-87=178), and Giovanni Huitron tied for 23rd (97-93=190). That put the Bulldogs 11 shots under their opening performance at 335 and, most importantly, 16 shots under Los Lunas (351) for a 681-690 win. “I just kept telling the boys, ‘Hey, we need you,’ and they all kept responding well,” said Bean. “Tanner again at the No. 5 spot just played fantastic. By the time Jake was walking up 18, we knew we had a cushion, and Wesley had beaten his Los Lunas guy by five strokes. Giovanni didn’t play his best, but he’d beaten his Los Lunas guy, and Parker was able to tie his on 17 and 18, which didn’t give any more strokes back. Endings, even happy ones, are always going to be tempered with a measure of sadness. Of the athletes that participated in the state tournament, the ‘Dogs and Lady ‘Dogs will be bidding farewell this season to three longtime varsity lettermen in Craft, Huitron and Archer, and their loss will be felt. “I’m very proud of our seniors, very proud of their leadership,” said Bean. But the 2017 AHS golf program’s story has a sequel of sorts in that the remaining four and three members respectively of the Lady Bulldog and Bulldog squads will be back next season, older, wiser, and ready to defend the crowns. “I think we have some JV kids that are also going to step up and be able to fill those spots, and I think we’ll be able to make another run at it next year,” said Bean. 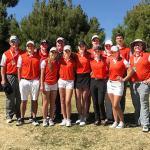 “We just really want to thank Sun Country Golf Association for their help with the rules. They had rules officials all over the golf course, and they did a fantastic job.